For a few months now a group of residents have been discussing plans to improve the area around 'Old Stanstead Road' (the bit that is not the south circular). With the support of the Forest Hill Society, and the active involvement of some of the committee members, local residents have been drawing up plans for a small community garden to improve the environment around Travis Perkins and a small plot of land. What is particularly nice about this group is the way they plan to involve local people, from children to adults, and have been able to get the support of local businesses and Lewisham Council. It is small scale projects such as this that help to create a sense of community and improve the surroundings for everybody in the area. We wish them the very best of luck in developing their plans for the community garden, and may what starts as a garden, blossom into even greater things! 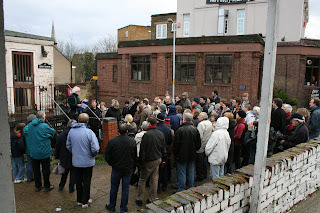 Minutes from last week's Sydenham Society public meeting are available on the Sydenham Town website. The presentation I made about the petition and survey conducted by Forest Hill Society can be downloaded from here. The presentation made by Peter Field from TfL can be downloaded from here but this is a big file (6Mb) so it may take a few minutes. All today's articles on the blog are from the March edition of the Forest Hill Society Newsletter. Paper copies are delivered to all our members - if you have not received your copy please contact me. Since the last edition we have been busy campaigning to keep the existing train services to London Bridge and we would like to thank you for your support. Our on-line petition has over 800 signatures from local residents in Forest Hill, Honor Oak, Sydenham, and beyond. Due to popular demand we are planning to have our second General Meeting on 10th May, and I am delighted that local resident and Mayor of Lewisham, Steve Bullock has agreed to speak at this meeting. So if you have questions about anything related to Lewisham Council, come along and put your questions to the top man. There will also be plenty of time to discuss other issues for Forest Hill and what you think the Society should be doing. This meeting is open to members and non-members and there should be seats for everybody (we have learnt from the popularity of our last general meeting). So I look forward to seeing everybody there. STOP PRESS: Forest Hill Society praised in Parliament. Forest Hill Pools (built in 1884) are amongst the oldest but certainly not the most spectacular of the Victorian era public baths. Many of the original features have been lost over the years. As a result, in May 2006 English Heritage turned down an application to have the building listed. The long-term future of the pools has hung in the balance for some time. They’ve been run on a management-only (that is, no investment) contract since 2001 pending a decision on their future. Not surprisingly, the condition of the pools deteriorated. A public consultation was held in October 2005 to determine whether local people wanted to refurbish the pools or knock them down and start afresh with a new build. The two options were limited but most people who replied chose the rebuild. However, the strength of feeling at public meetings and focus groups – which strongly supported refurbishment, retaining two pools – persuaded the Mayor to chose this option pending the outcome of the intrusive survey. The pools have been closed since March 2006 when the roof was deemed unsafe. Feb/March 09 - THE POOLS REOPEN! According to the consultants, Capita Symonds, it will cost £5.05 million to repair the pools complex. If you include inflation to 2008, the cost is nearer £5.6 million. Probably. But many people will be unhappy that other options for the pools have been lost for the time being. For example, the building could have been redesigned with a larger, more modern fitness suite if it went down to just one pool, rather than retaining both. Or perhaps the disused public building next to the pools (Louise House) could have been incorporated into the plans to create a much bigger community centre for Forest Hill, offering not only swimming and sport but a community hall and meeting rooms (sadly lacking in Forest Hill). The Mayor says financial concerns prevented other solutions being put forward and there are certainly some advantages to having two swimming pools rather than one. 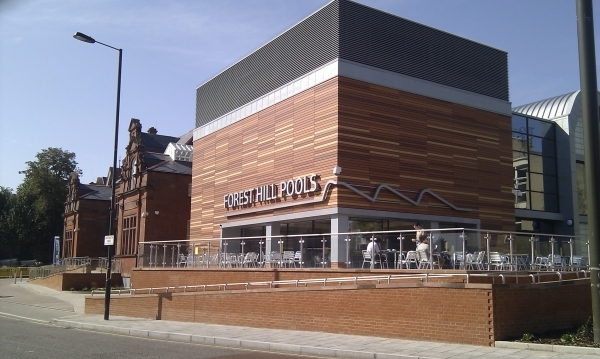 So perhaps we should just be glad that swimming is set to return to Forest Hill – perhaps in time to produce an SE23 champion for the 2012 Olympics!! The Forest Hill Society will be keeping a close watch on how things progress but do let us know your thoughts. And if you have a question for the Mayor on this issue, then make sure you come along to our General Meeting on May 10th when you can ask him directly. The Common Toad used to be really common in SE23 twenty or thirty years ago. But, as so often, loss of habitat has meant a serious decline. In London as a whole, 90% of natural ponds have disappeared and this is disastrous for toads who aren’t good at colonising new areas. Toads aren’t impressed with your average garden pond, so beloved of frogs and newts. A toad is looking for something altogether bigger and deeper. This is where the Devonshire Road Nature Reserve has been so successful. About 7 years ago, they created a large, deep pond and acquired toad spawn from Catford. Now, there is a very healthy toad colony there, which returns every March to breed. Once established in a pond they like, toads usually do well. There aren’t many creatures that’ll attempt to eat even toad tadpoles. They’re very poisonous! Unlike frogs, toads spend most of their lives on land; they only use the water for breeding. And they have excellent homing skills, always returning to the pond in which they were born. So on warm, damp nights in Spring, Forest Hill toads will make the long, dangerous journey back to their breeding pond on Devonshire Road. Many won’t make it. So how do you tell the difference between a toad and a frog? The most obvious difference is their skin. Frogs have moist, smooth skin. Toads have drier, bumpier skin, often brownish. Frog spawn forms large clumps, whereas toad spawn forms long ropes. George Orwell was fascinated by the Common Toad and in 1946 wrote an essay in which he said watching them return to their breeding ponds was one of the things he loved best about spring. He felt reassured by the fact that you could still enjoy this sight in London even though "atom bombs are piling up in the factories and the police are prowling through the cities." So if you’d like to see the creatures that inspired Orwell, do visit the Devonshire Road Nature reserve at its next open day on 25th March or with the Forest Hill Society on 15th April. They may not fire up your political fervour but, if you’re lucky, they’ll give you a true sense of Springtime. Today the House of Commons discussed train services to Forest Hill in an Adjournment Debate: Impact on Network Rail services of the Southern extension to the East London Line (Jim Dowd). You can view the debate on Parliament TV website, jump to approximately 90% through the broadcast to view Jim Dowd MP proposing the motion. Jim Dowd made the concerns of the Forest Hill Society and local residents very clear to The House and praised the Forest Hill Society and other local groups for their campaigning on this issue. 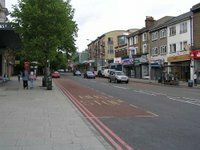 The debate covered many of the key issues for the Forest Hill Society and made sure that the Department for Transport is very aware of the concerns of local residents in Lewisham. We would like to thank Jim Dowd for raising this issue with the minister in parliament. Hansard transcript of this debate currently available here.